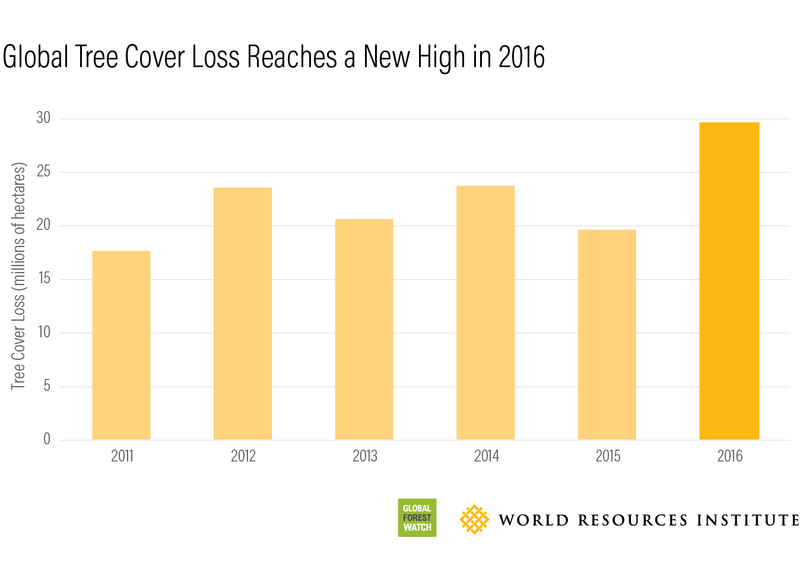 Global tree cover loss reached a record 29.7 million hectares (73.4 million acres) in 2016, according to new data from the University of Maryland released today on Global Forest Watch. The loss is 51 percent higher than the previous year, totaling an area about the size of New Zealand. Forest fires seem to be a primary cause of this year's spike, including dramatic fire-related degradation in Brazil. Deforestation due to agriculture, logging, and mining continue to drive global tree cover loss from year-to-year. The wide scale of forest disturbance shows the urgent need to improve forest management. Tree cover loss is not the same as deforestation. “Tree cover” can refer to trees in plantations as well as natural forests, and “tree cover loss” is the removal of tree canopy due to human or natural causes, including fire. Read more here. Fire rarely occurs naturally in tropical rainforests; fires happen when human use of fire interacts with extreme temperatures and drought. This year's trend is due in part to the global effects of 2015/2016 El Niño, the second-strongest ever recorded, which brought drought conditions throughout the tropics. Human-caused deforestation and degradation also make forests more fire-prone by drying the local climate. El Niño also plays a role in boreal and temperate forests, where fires are a more natural occurrence, but climate change is increasing the intensity and costs of fires. An increase in forest fires is worrying on many levels. Even in places where fires are an important part of the ecosystem, large blazes can have major impacts on human health and cause wide-spread damage to property and infrastructure. Forest burning can release huge amounts of carbon into the atmosphere, and, in tropical rainforests where such fires are rare, greatly impact forest structure and biodiversity. Interactions of tropical fires with land use change and climate change could lead to future forest diebacks in places like the Amazon. Better forest management can reduce the risk of fires starting in the first place: deforestation and degradation greatly increase the risk of fire in tropical forests, while in fire-prone ecosystems, overgrown forests results in more damaging fires. Early detection systems like VIIRS and rapid interagency cooperation mechanisms enable response to fires as early as possible to reduce damage and the costs of fire-fighting. To mitigate fire damage to people and forests, stopping the use of fire during dry times of year is crucial. Both Indonesia and Brazil have policies on the books to limit use of fire to clear land, but reports suggest these policies are not enforced effectively or are underfunded. Brazil's Amazonian region lost 3.7 million hectares (9.1 million acres) of tree cover during the 2016 calendar year, nearly three times more than in 2015. Most of that increase happened in the states of Pará and Maranhão, which were heavily affected by fire in late 2015 and 2016. Fire-related loss reflected in the 2016 data is mainly due to slow-moving fires that burn the understory, the layer of vegetation beneath the forest canopy. These fires generally do not kill all the trees or result in a change of how the land is used, which means the resulting damage to forests may not be picked up by other deforestation monitoring systems. They do, however, result in significant reductions in canopy cover, biomass storage and biodiversity (read more about these issues here). 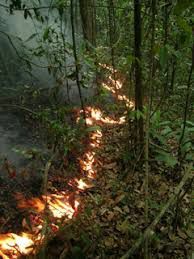 Understory fire in the Brazilian Amazon. Sustained heat from these slow-moving fires can kill small trees and increase mortality rates in following years. Credit: Jos Barlow. 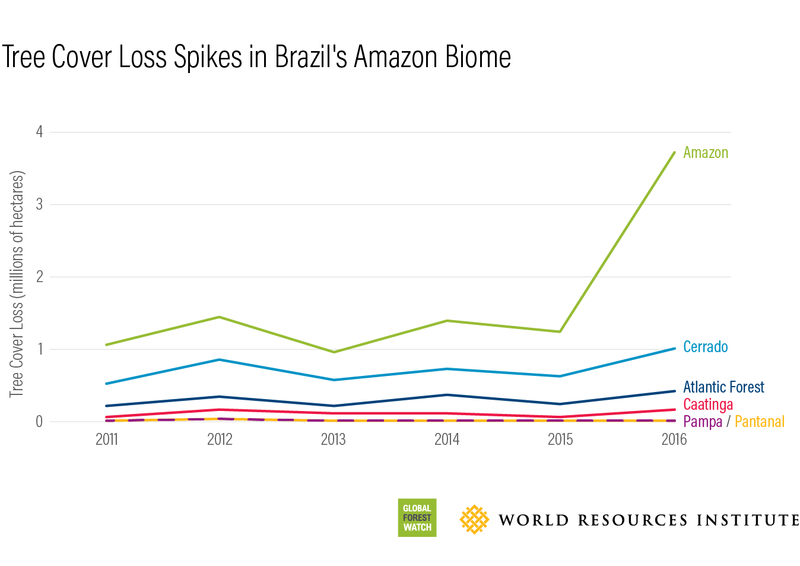 The official government deforestation monitoring system, PRODES, recently reported a decrease in deforestation in the Brazilian Amazon for the period August 2016 – July 2017, an encouraging trend after the major increase reported last year. The Brazilian figures measure clear-cut deforestation of primary forest and likely do not capture much of the fire-related forest degradation detected by the University of Maryland tree cover loss data (read more about the difference between PRODES and the tree cover loss data here). Both trends are important, and the scale of disturbance captured by the 2016 tree cover loss data highlights the need for holistic monitoring of forest change and corresponding implications for climate change, biodiversity and the overall integrity of forest ecosystems. Forest fires are likely to remain an important issue in Brazil – September 2017 had the most fires of any month since record-keeping began in 1998, with officials citing illegal fire usage compounded with lack of government oversight as the main cause. 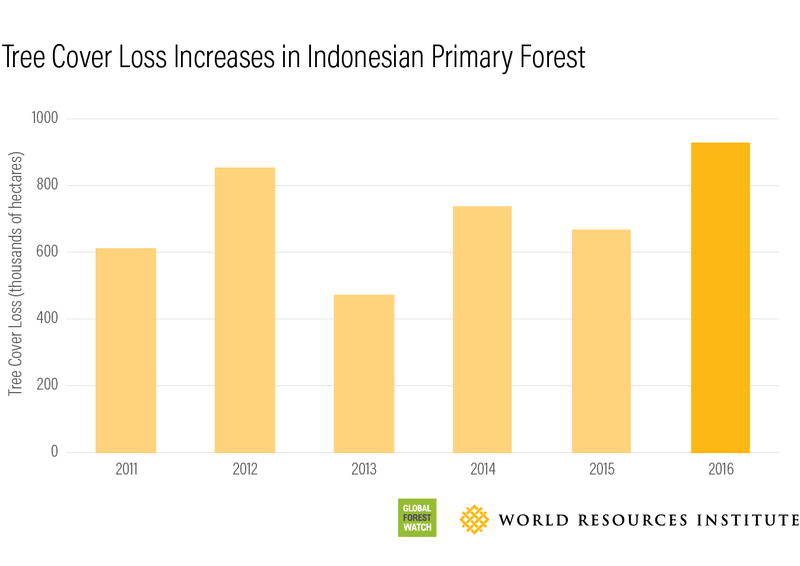 Indonesia also saw an increase in tree cover loss in 2016, likely related to the strong fire season of late 2015. The effects of logging and expansion of large- and small-scale plantations are also visible in Indonesia's 2016 data. Papua experienced an uptick in tree cover loss last year, which has continued in 2016, with oil palm plantations continuing to expand in primary forest. Tree cover loss in Indonesia and Brazil accounted for more than a quarter of global tree cover loss. 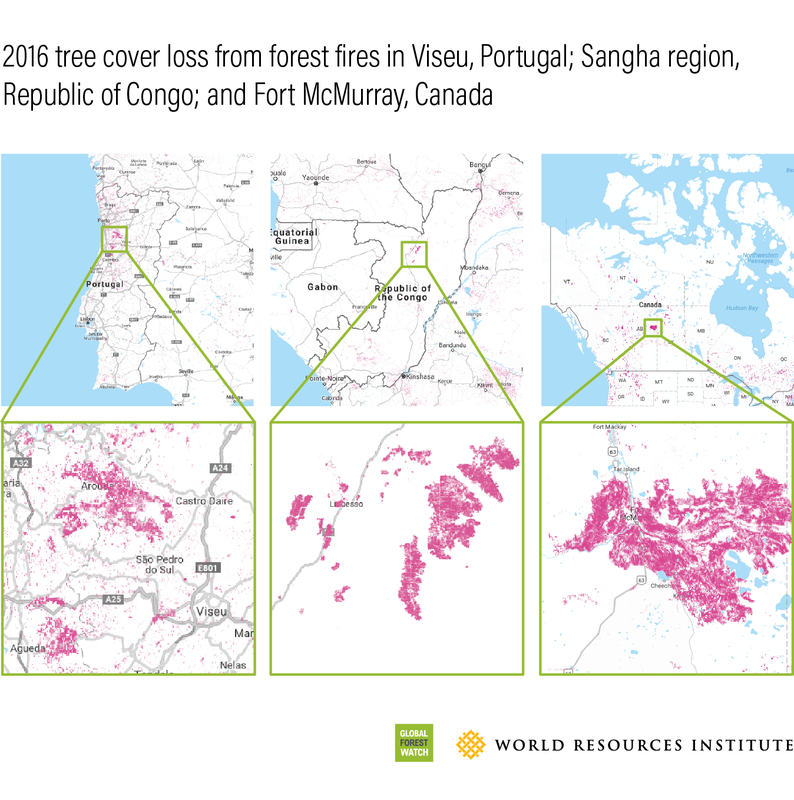 However, several other countries experienced massive fire-related forest loss in 2016. Portugal lost 4 percent of its total tree cover in 2016, the highest percentage of any country. Nearly half of all forest burned in the European Union in 2016 occurred in Portugal, exacerbated by the prevalence of fire-prone eucalyptus and pine plantations and poor land management and fire prevention practices. Recent deadly blazes point to another record-breaking year in 2017. In the Republic of Congo, one of the largest fires ever recorded in Central Africa destroyed 15,000 hectares (37,000 acres) of forest in early 2016. This fire, too, was likely strengthened by drought from El Niño and natural and human disturbance. Canada's Fort McMurray fire destroyed over 600,000 hectares (1.5 million acres) of forest and caused $8.8 billion in damage. Although wildfires are a natural part of boreal forest ecosystems, the likelihood and intensity of fires can be increased by El Niño effects and climate change. Recent blazes in Brazil, California, Portugal and elsewhere suggest that forest fires are not going away – indeed, they may only get worse as the planet warms. The large scale of forests affected by fire and other drivers in 2016 makes it clear that, now more than ever, we need to work together towards better forest management. The authors would like to acknowledge Matt Hansen, Peter Potapov and Svetlana Turubanova, who updated the tree cover loss data, and Doug Morton, Mark Cochrane and Carlos Nobre, who provided valuable background information for this article.